The Depstech WiFi Borescope Inspection Camera is a smartphone accessory that’s unlike anything you’ve ever seen. This awesome little borescope camera connects wirelessly to any iPhone or Android phone, and the handset is then used as a viewfinder. The camera itself can then be snaked into anything to give you a view that would be impossible with any other camera. Snake it through AC vents or pipes, and even down into sewer grates with a hook attached to retrieve keys or anything else you might have dropped. Seriously, this thing is worth its weight in gold. 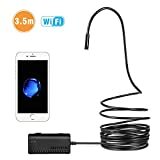 The Newest Type Endoscope: Unlike other endoscope camera on the marketplace, this wireless wifi endoscope camera not only work with Android smartphone(Above Android 2.3), but also iPhone IOS system(Above IOS 6.0). This is perfect for iPhone user who want do inspection work. Without using extra adapter or cable, it can be easily connected with your smartphone via WIFI. The only thing you need to do is to download and install the compatible APP “WIFI VIEW”on your device. Unique Blue LED technology,6 adjustable blue LED light on camera tip, it greatly helps to improve image brightness and clarity even in dark or low-light condition. Moreover, the art of 1200P camera offers you a wonderful experience of recording a clear close range HD video in AVI format and snapshot image in JPG format with three adjustable resolutions 320×240, 640×480, 1280 x 720,1600×1200. Featuring 11.5FT cable, waterproof and 8.5mm diameter camera, this endoscope can suitable for various types of environment, for example, low-light or dark area, damp or wet area etc. Furthermore, armed with bendable semi-rigid cable which can bend and hold it’s shape to access a wide variety of confined place. Design Patent: For this WiFi version endoscope, we have applied the certificate of Design Patent.